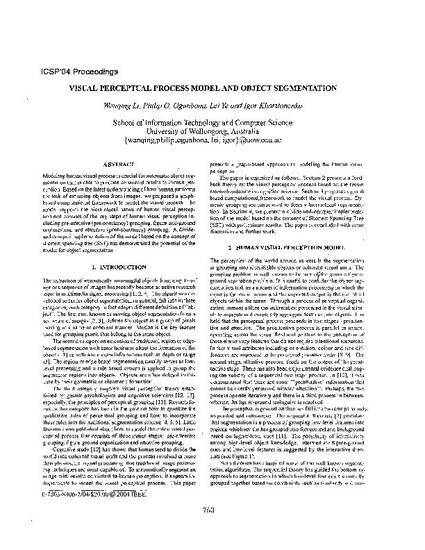 This paper originally appeared as: Li, W, Ogunbona, Lei, Y et al, Visual perceptual process model and object segmentation, Proceedings. 7th International Conference on Signal Processing, 31 August - 4 September 2004, vol 1, 753-756. Copyright IEEE 2004. Modeling human visual process is crucial for automatic object segmentation that is able to produce consistent results to human perception. Based on the latest understanding of how human performs the task of extracting objects from images, we proposed a graph-based computational framework to model the visual process. The model supports the hierarchical nature of human visual perception and consists of the key steps of human visual perception including pre-attentive (pre-constancy) grouping, figure-and-ground organization, and attentive (post-constancy) grouping. A divide-and-conquer implementation of the model based on the concept of shortest spanning tree (SST) has demonstrated the potential of the model for object segmentation.